Jada Pinkett Smith was one of the first and loudest critics of the Academy after the Oscar nominations were announced last Thursday. As you know, Will Smith was campaigning hard for a nomination for his performance in Concussion and she’s been encouraging people to boycott the Oscars. That call for boycott was seconded by Spike Lee. 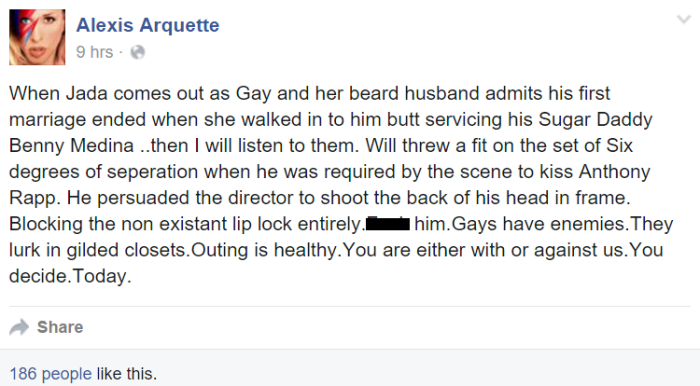 Yesterday Alexis Arquette slapped back at Will and Jada on Facebook for being “gay hypocrites”. Alexis’s post has since been pulled down, probably because she subsequently realised, or someone told her, quite rightly, that you don’t have to pick sides, and that undermining one message doesn’t strengthen another. Or maybe there was the threat of a lawsuit. So it’s a sh-t situation X 2. Because this is a distraction from a movement that’s building momentum and could effect significant change. It’s not like the status quo needs any more advantages. The status quo, by definition, IS the advantage. But also, in any other circumstance, come on, this is great gossip. You know. But the way this evidence has been collected, it’s like the gossip equivalent of the fruit of the poisonous tree. OK, fine, it’s totally not, because I am not Dean Strang, legal expert and heartthrob. But the dumbass analogy I was trying to make here is that we can’t use Alexis’s delicious reveal because of the context in which it was provided. The evidence is not admissible.